What the *beep* happened to my weekend? Judging by the stiffness of my back, too much of it was spent on major spring cleaning (thanks to my furry felines Murdock and Elektra, I generally think of cleaning the apartment as “defluffing,” a process that requires chasing rapidly multiplying dust bunnies while bent into uncomfortable positions). So, sadly my Daredevil: Season One review will have to wait until tomorrow. However, there were some news items to come out over the weekend – solicitation-related, to be exact – that I felt were worthy of their own post. So, here goes! 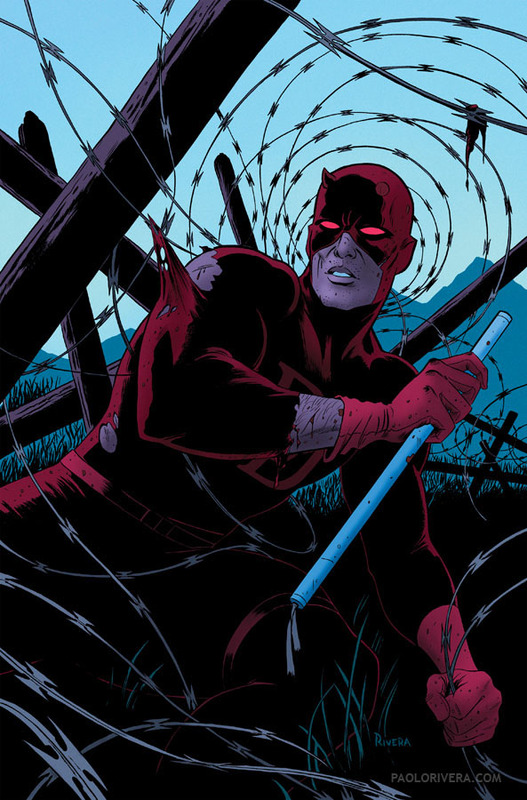 Marvel’s July solicitations included Daredevil #15. The issue’s interior art is by Chris Samnee and Paolo Rivera gives us yet another lovely cover. According to Chris Samnee, Daredevil #15 is the second in a three-issue arc, which makes me wonder about the “arc status” of issues #12 and #13, but I’m sure that will sort itself out. The Thing and The Human Torch investigate a mysterious magical paradox in space and time with the help of Doctor Strange! What dark secrets haunt the history of the ClanDestine? Legendary comics creator Alan Davis kicks off a series of ClanDestine adventures, continuing in Daredevil Annual #1 in August! That’s it for now. I hope you guys have a great rest of the week, and I’ll see you all back here very soon! Love Alan Davis, but unfortunately I have to say I think his art peaked back in the 90s. Daredevil vs. Psylocke? These always depend on how the writer rigs the fight with the setting or outside factors, but if Psylocke has her mutant powers the fight should last all of 2 seconds. If the Avengers have some sort of Stark tech that blocks psychics, which is very likely, the fight would likely go to DD barring outside factors. well, Psylocke has the upper hand, with her powers and all… but lasting two seconds? She’s a psychic, but she cannot shut off a guy’s mind the way Emma Frost or Charles Xavier could. Actually Psylocke has been built up to be an omega level psychic in X-Force by Remender who is also writing this match-up. The psychics will be predictably nullified somehow so they don’t take down 90% of the Avengers moments after the fighting starts otherwise its just terrible storytelling because thats what should happen. THough I think the most absurd thing about this whole scenario is that Matt Murdock wouldn’t side with the Avengers in this whole ordeal. Heh, that annual, with its link to other titles, is strangely reminiscent of the ‘tie-in’ annuals have recently been reading in the early 90s! And that’s not particularly promising. Apropos of nothing, Christine, do we have a release date for ‘Season One’? Daredevil: Season One came out last Wednesday (April 11), but I have yet to get to my review. Love Alan Davis and this sounds like some old-school type of Marvel fun so this might be interesting. As for his fight against Psylocke, meh. Yeah, she should win within 5 seconds but I’m sure DD will win simply because he is an Avenger and they look set up to win regardless. I just hate to see Matt dragged into this mess. I have been a DD fan since the Bob Brown days of the 70s (anyone else think that Bob’s DD run at least slightly resembles Irv Novick’s Batman run? Love ’em both!) Chris Samnee, to me, is a wonderful cartoonist and I’m overjoyed that he’s doing a book I already collect. Looking forward to Mike Allred’s appearance in a couple months. Issue 14 had one of the best jaw-dropping cliffhangers DD has had in a while.